MALAPPURAM: A brace from Abhiram Shaji in the first half followed by a pair from Gokuldeep E in the second half helped Nirmala College, Muvattupuzha to register a thumping 4-0 win against SN College, Kannur in Friday’s second semifinal of TNIE GOAL 2017 at the Malappuram District Sports Council Stadium. They will now meet MD College, Pazhanji in Sunday’s summit clash. It was left-winger Abhiram, who opened the account for Nirmala in the ninth minute, after capitalising on an error made by the SN College custodian. And Abhiram was yet again in the thick of action in the 22nd minute when he fired in a long-ranger to make it 2-0 for the eventual winners. In the process, the talented youngster also increased his tally in this year’s competition to four goals. Gokuldeep, who had put on an impressive show as the attack-minded midfielder in Nirmala’s 4-3-3, made it 3-0, finishing off a team move in the 78th minute before sealing the victory in stoppage time firing past SN’s stand-in keeper. 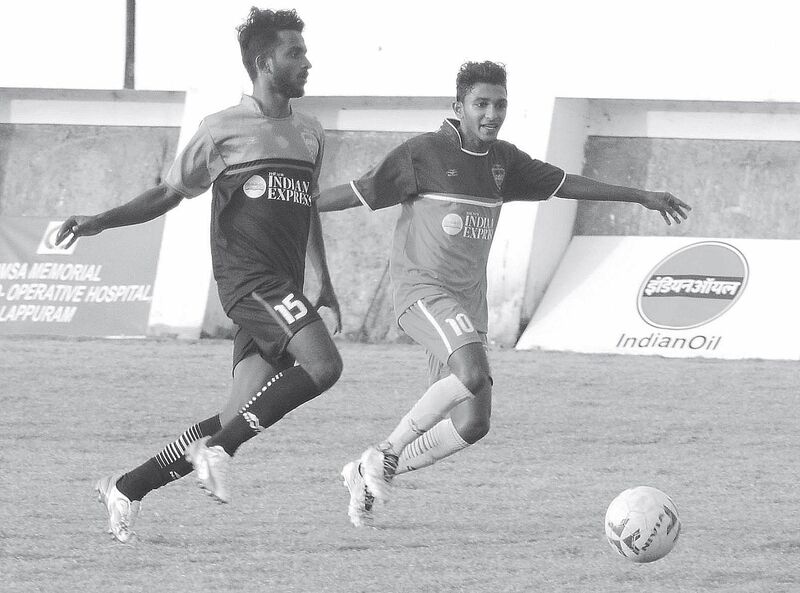 It was sweet revenge for Nirmala College, who had been edged out 1-0 by SN Kannur in the semis of TNIE GOAL 2016. While last year’s semifinal was a closely fought affair, Nirmala cruised to a comfortable victory this time around. Nirmala’s first goal was set up by Gokuldeep,who flicked a cross from the right drawing the SN custodian out,which allowed Abhiram to nod the ball in. Abhiram needed no such help in the 22nd minute when his swing from the left wing dipped in beyond the reach of the SN goaltender-- a flash of individual brilliance helping the MG University champions to pile on the agony of Kannur University champions. Abhiram actually took off from where he had left off in the quarterfinal,when he scored twice against Kottayam Baselius College. He would go on to score a deserving goal in the 78th minute when he reached the box after exchanging passes with Jithin and slotted past the keeper with calm and composure. SN’s goalkeeper Iqbal was sent off in the 82nd minute for a foul on Jithin, who was through on goal, and midfielder Sujilmon was forced to tend the goal.